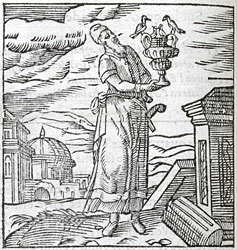 Alciato at Glasgow: Emblem: Scyphus Nestoris. Le vase de Nestor. Quod gravis argenti massa profundit opus. Unamquamque super fulva columba sedet. Solus eum potuit longaevus tollere Nestor. Maeonidae doceas quid sibi Musa velit? Aurea sunt caeli sidera claviculi. Umbilici gemini, magna minórque fera est. Bella gerunt fortes: callidus astra tenet. Receive this bowl of Nestor with its double support, a work which a heavy mass of silver shaped. Its studs are of gold. Four handles stand about it. Above each one sits a yellow dove. Only aged Nestor was able to lift it. Do tell us what Homer’s Muse intended. The cup itself is the heavens; its colour is silvery; the studs are the golden stars of heaven. They think that what he called doves are the Pleiades. The twin bosses are the great and lesser beast. The wise Nestor understood this by long experience: the strong wage war, the wise man grasps the stars. De soustenir la coupe, & seul l’experience. A quoy cecy Homere en ses vers inventoit? Par addresse d’esprit & par un long usage. Mais l’homme bien sçavant atteint jusques aux cieux. 1. Nestor’s bowl is described at Homer, Iliad, 11.632-7. Only Nestor, for all his great age (see Emblem 25. n.5, [FALc025]) could lift it when full. For the interpretation of Nestor’s cup (or mixing bowl) given here, see Athenaeus, Deipnosophistae, 11.487 F ff. 2. The Greek word for ‘doves’ is πελειάδες. 3. ‘twin bosses’, i.e. possibly the protuberances inside the bowl where it was joined to the two supports. 4. ‘great and lesser beast’, i.e. the Great and Little Bear, a phrase based on Ovid, Tristia, 4.3.1: ‘magna minorque ferae’.